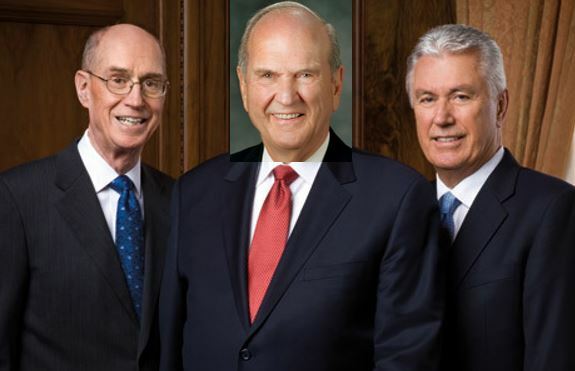 With President Monson’s passing, Russell M. Nelson will be called as the prophet of the LDS Church and will choose his two counselors. The prophet obviously has the most sway in policy and doctrinal decisions in the Church. But the First Presidency acts as a body, and the two counselors are considered to have considerable impact on decision making. Further, if the prophet becomes incapacitated, which sometimes goes for years at a time, then the counselors become very important. Of course, there is speculation about who Pres. Nelson will choose as his counselors. My take on the buzz in the ProgMo world is that speculation is about 50-50, he will retain Pres. Eyring and Pres. Uchtdorf or that he will buck the system and choose someone new. Here are some of the comments I’ve seen online. I bet he picks Oaks for one of them. I worry that Nelson will replace Uchtdorf with Bednar. I think he will bring his buddies Ballard and Bednar into the First presidency. I don’t hold out much hope that he’ll keep Uchtdorf and Eyring for counselors. If I had to guess I think Eyring will stay, but Uchtdorf will be out. The general idea here is that Uchtdorf is wildly popular in the ProgMo world and Eyring is seen as a moderate. Oaks and Bednar are viewed as hardliners. Some view Nelson as a possible hardliner. Especially with his statement in a Jan 2016 talk at BYU-Hawaii that the Nov 2015 LGBT exclusionary policy was a “revelation”. And then also his Feb 2003 Ensign article where he famously refuted the idea that God’s love is unconditional. It’s important to note, neither of these were done in general conference talks. And the unconditional love thing was challenged later in a conference talk by D. Todd Christofferson. I personally have never viewed Nelson as a hardliner. The Divine Love Ensign article seemed like a weird outlier that he never seemed to build on. His talks have always seemed moderate and non-controversial. The Jan 2016 statement calling the Nov 2015 policy a doctrine…I have to admit I was extremely disappointed by that. I don’t know what to make of it. My optimist self will write it off as his attempt to show support for President Monson. He has never been the guy to address controversial topics on a regular basis. I’m still viewing him as a moderate. But I guess we will see. But I think we’ll have to wait a little longer. I highly doubt his counselor selection is going to be anything but a formality. Ok, so let’s get into some data. This First Presidency reorganization will be the 11th time a new prophet has chosen counselors since the death of Joseph F. Smith in 1918. The table here shows each prophet, and their counselors at the time of their passing. We see 14 out of 16 times the new prophet retained a counselor he inherited from prior presidency. The two exceptions were Hugh B. Brown and Marion G. Romney. MGR was very old and not functional in his role as a counselor. That one was understood. HBB was a surprise. He was considered more on the liberal side of things, and with Joseph Fielding Smith as the new prophet considered to be on the conservative–hardliner side of things, it is believed that was intentional snub. One time that has happened out of 16 possibilities. One other noteworthy point is the asterisk for J. Reuben Clark. He was moved from 1st counselor to 2nd counselor by the new prophet David O. McKay. Some saw that as a scandalous move. What I make of this is that I believe there is very low probability Russell M. Nelson does anything but keep Eyring and Uchtdorf in their same spots. If he does, it is a virtual certainty that will cause a roar of speculation. Especially if the move is a removal of the liberal Uchtdorf or the adding of the conservative Bednar.